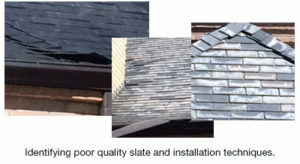 Independent testing is a key to determining the overall cost of ownership and value a slate roof can add to a property. Greenstone architectural roofing slate meets the ASTM C406* (see About Slate Standards below), rated S1 slate standard, through direct independent testing by National Slate Association approved engineering/testing organizations. In fact, Vermont slate has all the physical characteristics of the best quality slate available. A Greenstone Slate roof can be expected to have a useful life range from 75 to more than 300 years. See the Greenstone Slate 100 Year Warranty statement to learn more about how we stand behind the our material and manufacturing. *ASTM is the American Society for Testing and Materials, an international standards organization. Slate standards are set by ASTM International, a non-profit, independent organization for standards development for building materials. In 1957, ASTM established a consensus material standard for slate used for roofing shingles. This material standard is designated as ASTM C406, “Standard Specification for Roofing Slate.” ASTM C406 addresses material characteristics, physical properties and sampling procedures appropriate to the selection of slate for use as roofing shingles. Greenstone Slate® has been directly tested and approved for use in Miami-Dade County Florida including hurricane zones, with standing hurricane force winds with rain. See the most recent letter of approval from Miami-Dade County here. Greenstone roofing slate is created by cutting slabs of slate with diamond tipped saws, which is then hand split by Greenstone trained craftspeople. They know how to “read” the stone to achieve the consistency in slate thickness needed to create the unique texture of a quality natural stone roof. The slate manufacturing process finishes with precision trimming of the slates and laser tracked positioning of the nail holes that are hydraulically punched—not drilled. The Greenstone Slate Installation Guidebook with proven installation techniques, as well as direct support and recommendations for installation hardware accessories is provided to contractors to promote excellence through the final installation. Beware of lesser quality slate. Low-grade slate is available in the marketplace. The ASTM standards are a reliable indication of slate quality. For existing slate roofs, signs of poor quality slate include but are not limited to unnatural fading and warped slate as shown here. Using some slate—notably a few imported brands—can result in a slate roof that soon does not withstand the elements. The most serious problem that occurs with low-grade (shale) slates is that they are prone to separation which leads to a leaky roof! Investing the time to seek out top quality slate pays off—particularly since a quality slate roof is the long-term, low-cost-of-ownership roof — and a roof that will retain its aesthetic appeal throughout its lifetime. Visit the Greenstone Slate® slate roof gallery. Recent development in materials technologies has generated some new roofing materials, but still none can compete with natural stone for durability and stability. Slate remains the leader as the world’s longest lasting and most trouble-free roofing material. A slate roof is the standard by which all others are compared.